Publisher: The History Press, 2013. Atlanta is a unique southern city known for its vast diversity and fast-paced lifestyle. Rarely is it associated with a rich beer and brewing culture, but not for a lack of one. 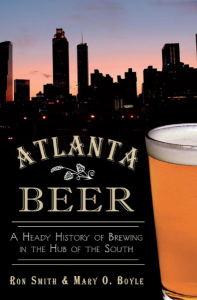 From Atlanta's first brewery in the 1850s to the city's Saloon Row and the parched days of local and national Prohibition, the earliest days of Atlanta's beer history are laced with scandal and excitement. Follow the journey of beer through Atlanta's development, starting with colonial Georgia and the budding wilderness settlement of Terminus and eventually evolving into the ever-growing metropolis known as Atlanta. Authors Ron Smith and Mary Boyle celebrate the resurgence of craft beer in a town that once burned to the ground. As Atlanta rose from the ashes of the Civil War, so also has artisanal beer made a comeback in this enigmatic but resilient city.